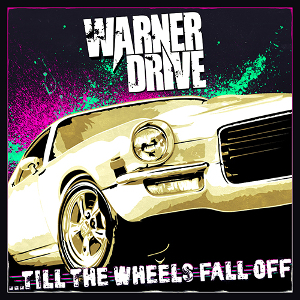 Hollywood, CA.-based rock band WARNER DRIVE (*sound comes out when the page opening) will release their fourth album “Till The Wheels Fall Off” through Roasting House/Dead End Exit on July 28th. The band features catchy riffs, a rock/punk edge, and an incredibly energetic performance and and has built a reputation as relentless internationally touring act. WARNER DRIVE has shared the stage with bands such as Jet, CKY, Saving Abel, Camp Freddy, Danko Jones, Imagine Dragons, The Plain White T's, Yellowcard, Ratt, Steel Panther, Clutch, Graveyard, Mustache, Papa Roach, The Killers, Dead Sara, Royal Republic, Queen, Twister Sister, Foreigner, Megadeth, Anthrax, and many more. WARNER DRIVE has been hailed as a highlight of the Sunset Strip Music Festival where they tore up the Roxy stage for a sold out house. Warner Drive had released three full-length albums to date, selling over 15,000 copies in DIY fashion. Their first album “Fully Loaded” (2006) was produced By Mike Clink (Guns N' Roses, Mötley Crüe, Megadeth) and James Michael (Alanis Morissette, The Deftones, SIXX:AM), and the second album “K-Go!” (2011) was self-produced. Their third release “City Of Angels” (2014) was produced by El Hefe (guitarist of NOFX and co-owner of Cyber Tracks), and mixed by Ryan Greene (Megadeth, Bad Religion). WARNER DRIVE will continue hitting everywhere from Los Angeles to the rest of the world this year again.